Standard Pacific Homes officially introduced a new award-winning collection of townhomes in the Skybrook community with a ribbon cutting ceremony. The Cabarrus Regional Chamber of Commerce attended with Mayor Scott Padgett presiding over the ceremony. The event took place at the Skybrook model homes, and the day included tours of these models as well as a tasty lunch. The three-story townhomes are brand new to the Charlotte area, and the innovative designs provide ample living space with each home featuring over 2,000 square feet. Being exceptionally unique, these Huntersville new townhomes combine the style and space of a single-family home with the low-maintenance lifestyle that a townhome provides. Starting in the low $180,000’s, these townhomes offer an abundance of architectural details at a modest price. Considering the fact that Skybrook is a premiere Golf community in Charlotte that provides its residents with outstanding amenities, the price of these homes is a bargain. 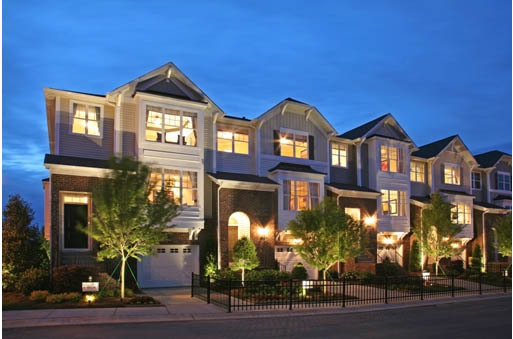 Be sure to visit Skybrook and tour the model homes yourself. I have no doubt that you’ll be just as impressed as the mayor was. This entry was posted in Charlotte new homes, North Carolina and tagged golf community in charlotte, Huntersville new townhomes, standard pacific homes on September 11, 2008 by Carol Morgan.